If you enjoy this newsletter, please forward it to a friend. 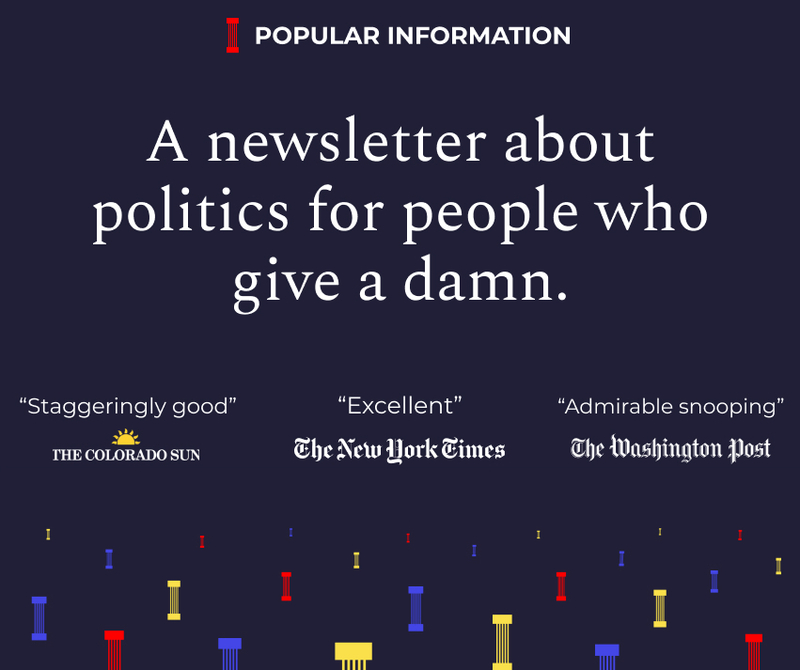 If you’ve been forwarded the newsletter, you can sign up at popular.info. The ongoing family separation crisis involves some startling numbers. For example, 2551 children ages 5-17 have been separated from their parents as a result of the Trump administration’s policy. As of Monday, the last time the government updated the federal court, just 879 kids have been reunited with their parents. The numbers, however, can obscure the fact that behind them are actual people — each with a unique experience. An extraordinary court filing last week provides a harrowing look at the humanity behind the data. The documents, filed in United States District Court in California and first reported by the Texas Tribune, include hundreds of declarations from parents and children, many of whom were detained as part of the Trump administration’s “zero tolerance” policy. Their stories provide an unprecedented look at what life is like for people caught in the administration’s legal dragnet. Here are a few of their stories. Ana V, 26. Daughter, 6. Ana left El Salvador after receiving death threats because she is gay. She says the same people who threatened her beat one of her transsexual friends to death. She feared for her daughter’s safety. After arriving in America, she reports that the guards “yelled at me and called me names” and “kicked me with their boots in order to keep me awake.” The facility where she was held was referred to by her and many other migrants as the “Dog Pound.” It was extremely cold. She describes the food as “frozen and bad.” She arrived “wet and muddy” but was not able to change. According to Ana, her daughter was shivering, hungry and unable to sleep. Denia M, 21. Daughter, 1. Denia left Honduras after her husband, who owned a store, stopped paying gangs the “war tax” that the gangs demanded. She then watched as gang members murdered her husband and burned down the store. She was told to run away or she would be killed too, along with her infant daughter. Upon arriving at the detention facility, Denia’s daughter began having diarrhea but she did not ask for a doctor because she is “afraid officials will retaliate.” Her daughter developed a bad rash. She reports another baby did not have a bowel movement for four days and the mother did tell the guards, but they did nothing. Dixana is a 10 year old who was taken into custody on May 23. Upon arriving at the detention facility she was immediately separated from her mother. She slept in a cell with a large number of girls on the concrete floor. Gladys S, 29. Daughter, 5. Gladys was charged $9 for a 15 minute phone call. Lidia S, 21. Son, 4. Lidia fled El Salvador after witnessing someone being decapitated. She saw the faces of the murderers, who threatened to kill her. She came to the United States around June 13 and presented herself to the authorities. Mayra S, 29. Son 9. Mayra reports that her son is “badly traumatized” by the experience and has been wetting his bed. He keeps asking her when they will get to the United States. Sindy S, 29. Son 9. Daughter 8. Sindy reports repeated verbal and physical abuse from the guards. “Why did you come to this country, and now I have to pay for you with my taxes?” she heard one say. The guards wake up people in the night by kicking them. Victor says he was allowed to make one phone call but no one picked up. “This is it for you. You’re fucked,” the CBP officer told him. Ana P, 36. Daughter 11. These are just a handful of the migrants’ stories. You can read more at the Texas Tribune. Trump’s core political strategy is to pivot from one political controversy by creating a new one. (I discussed this strategy in detail, using the theories of French philosopher Roland Barthes, in this essay.) This is one reason why, over time, Trump has been able bleed interest in the family separation crisis from the public and the media. It was dozens of controversies ago. Monday’s gambit was a threat to revoke security clearances from Obama administration officials. None of these officials have done anything in particular to justify such an extraordinary move, but that’s not the point. There’s just one problem. Some of these people don’t even hold security clearances. Comey told his friend Benjamin Wittes that he does not hold a clearance anymore. Michael Hayden indicated that while he has a clearance, he does not use it and revoking it wouldn’t have any impact on him. The entire episode indicates how amateurish the White House is in executing a “pivot.” They decided to threaten the security clearances of a group of officials without even bother to check with the FBI if those officials even had a clearance. In Monday’s email, I argued that most people should ignore polling — specifically the horse race polling about who is up or down. The argument provoked a response from Nate Silver, the editor of 538 and one of the most sophisticated journalists covering horse race polling. I largely agree with Silver’s point. The kind of rigorous analysis he does is superior to talking heads just making up predictions on TV. But I also think it’s a false choice. There were also thoughtful dissents from Sean Trende of Real Clear Politics and Ariel Edwards-Levy‏ of HuffPost Pollster. [W]e show that these impressions of probabilistic forecasts cause people not to vote in a behavioral game that simulates elections. In the context of the existing literature, the magnitude of these findings suggests that probabilistic horse race coverage can confuse and demobilize the public. If you enjoyed this email please forward it to a friend. If someone forwarded you this email, you can subscribe at popular.info.